You’re hiking a woodland trail when suddenly you come upon a bear. Whether you’re boondocking or staying in a campground, if you hike in the woods, sooner or later this could happen. So what to do? First thing, try to quickly determine the bear’s actions or its intentions. Did it see you? Is it moving toward you or across your path? Is it feeding? Is there a cub nearby? If so, Mama may be very protective. Is it agitated? The bear’s body language will alert you about what to do next. Always let a nearby bear know you are there. Talk with your hiking buddies. In national parks with bears, buy a set of bells in the visitor center to wear. • Drop your head and do not make eye contact. • Slowly back away from the bear until you’re out of sight. • Take a different route. On rare occasions a bear may bluff a charge to frighten you off. In that case, no matter what your feet are saying, DO NOT RUN! A bear can run faster than an Olympics sprinter. Don’t climb a tree: Bears are better at it than you. Instead, if the bear continues to charge, most experts suggest dropping into a fetal position, legs tucked under your body, arms and hands covering and protecting your head. The theory is that when the bear determines you’re no threat it will go away. That said, if the bear should attack, then fight back – throw sticks, stones or dirt in its face; kick and scream (the latter should come naturally). • Make noise so bears know you’re in the area and can avoid you. • Carry bear repellent spray. • Don’t carry a smelly dead fish in your backpack. 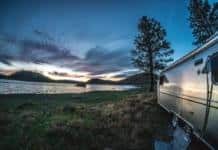 • Back at the campsite, keep your food inside your RV. Check out Bob Difley’s RVing e-books on Amazon Kindle. Next articleBuilding an RV park from scratch: We met the neighbors!